What is the database server usage size available with the Amazong AWS RDS free usage tier? At http://aws.amazon.com/free/, the documentation indicates the Free Usage Tier comes with 30 GB of Amazon Elastic Block Storage, and for database/RDS, 20 GB of database storage. When I create launch a new database SQL Server Express instance with the AWS Toolkit for Visual Studio 2010, the minimum allocated storage available is 30gb. Is this an undocumented feature, as I believe creating the instance through another interface shows 20gb? From this I gather that each database on this instance will be limited to 10GB (SS Express). I have created a Windows Server/IIS instance which leaves about 7 gigs of EBS left on that box. 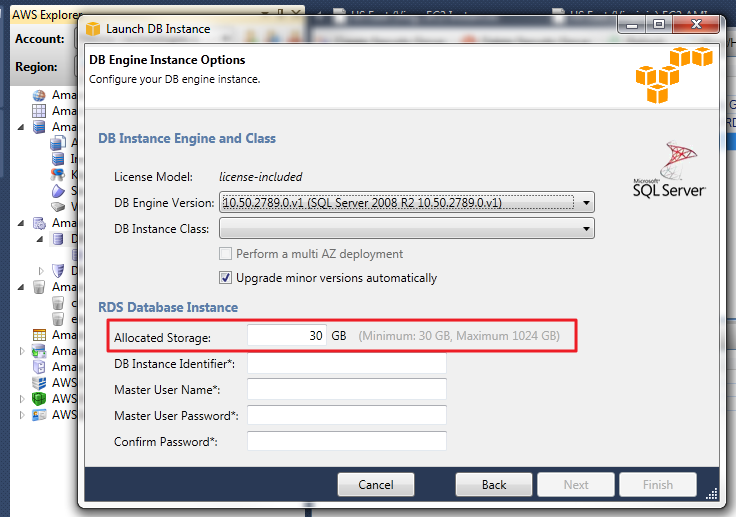 Does this mean I still have 30gb available for my databases on the db engine instance (separate db server)? If a database size reaches/exceeds 10gb, will AWS/RDS automatically scale my account up to the next SQL Server version? If so, how can I avoid this? To be eligible to the Free tier, you have to select a micro instance and use a maximum of 20 GB of storage. The only version of SQL Server that supports this is SQL Server Express Edition. The Amazon AWS Console will let you launch this type of instance with 20 Gb of storage. Not the answer you're looking for? Browse other questions tagged amazon-ec2 amazon-web-services amazon-rds or ask your own question. 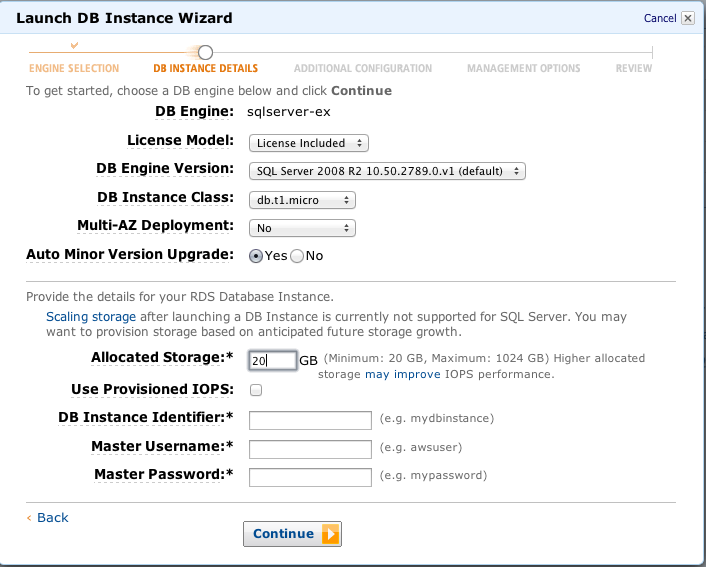 How to Rename a Database on a SQL Server Amazon RDS Instance? How to calculate the size of an AWS RDS instance from a MySQL dump? Is it possible to determine the type of instance for an AWS RDS MySQL instance from within MySQL?